If you are looking for an effective, easy to use curriculum that not only fulfills the Erin’s Law Mandate, but delivers a difficult topic in an educational, engaging, and enjoyable way, then look no further. This is the Be Seen and Heard© for Students with Special Needs online program. The basis of the program is rooted in Victor Pacini’s Be Seen and Heard© live program. Victor Pacini has collaborated with social worker, Natalie Shamie LCSW, MSW, and special education teacher, Marcy Rossi M.A.Ed Special Education and NBPTS. 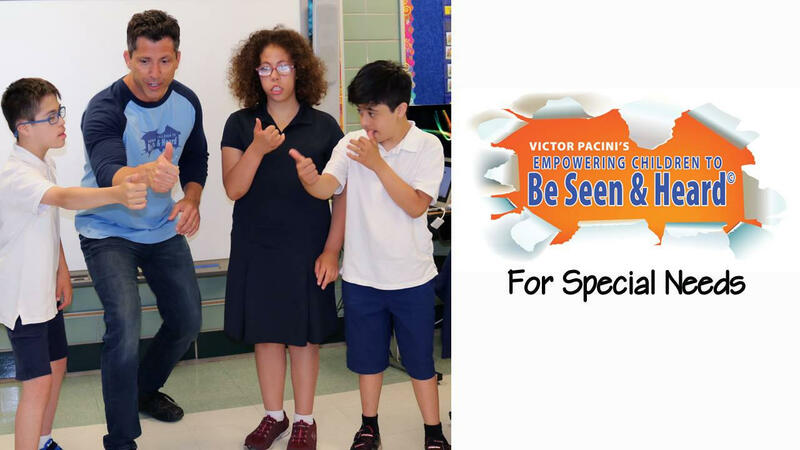 Be Seen and Heard© for Students with Special Needs is a multi-module program that uses simplified and adapted hands-on materials, along with communication supports that allow for students with special needs to learn about the dangers of abuse. Songs and stories, using repetition and familiar language help students differentiate between safe and unsafe touch. The terms “sexual abuse” are not used in this foundation program. Here’s what comes with the Be Seen and Heard© for Students with Special Needs online experience! ✓ Full access to the 8 online video presentations and activities that create effective formats for teaching and raising awareness, along with follow up questions. These high energy videos are designed to go at your own pace. Each video offers follow up questions that encourage repetition of the material. A SAFE AND ENGAGING ENVIRONMENT – Children learn to identify and label body parts and Private Parts (bathing suit rule). They will also learn the difference between safe and unsafe touch and the feelings associated with these interactions. A PERSONAL STORY – Children learn about a boy’s personal experience with abuse and how he kept it a secret. Safe and unsafe secrets are discussed and The discussion of how unsafe secrets are not healthy to keep in any situation come alive in the story. TRUSTED HERO© LESSON – Students identify the people in their lives that they trust and can turn to in any difficult situation. Helps students realize that these people can be trusted and are tools to be used for protection and help. STUDENT EMPOWERMENT – Children will have a voice in who they are, the confidence to speak up, and the awareness to recognize a potentially dangerous situation. The Be Seen and Heard© For Special Needs is a 1 "school year" license.